The assets of ATP – Inc. have been acquired by The Lodi Group of Monterrey, Mexico. Under new ownership, the company begins operation as Automotive Technology Products LLC (ATP), effective today with no disruption in business. The company says its first priority is to restore order fill to its extensive customer base and continue a long tradition of supplying the highest-quality with excellent customer service, near term. “As an OE manufacturer of flywheels, flexplates, ring gears and other related powertrain products, The Lodi Group is proud to add Automotive Technology Products to our family of companies serving the automotive aftermarket in North America and the rest of the world. With manufacturing capacity in place and redeployment of existing inventories, personnel and equipment, we plan to return service levels to normal and business as usual in a very short time,” said Jorge Frias, president of Automotive Technology Products LLC. Automotive Technologies Products LLC is an aftermarket supplier of transmission parts, kits chemicals and filters as well as flywheels, flexplates and cables. In addition, its Graywerks line of hard parts complete its broad product offering. The Lodi Group owns manufacturing facilities in North America as well as automotive aftermarket supply companies specializing in powertrain and transmission components. ATP has released, 18 New Cable part numbers covering 10.5 million additional vehicles. ATP Cables feature a quality polymer insulation to protect from corrosion and abrasions, ensuring long lasting performance. Each cable is designed to fit, look and perform like the original cable and includes all necessary brackets, grommets and ends, providing a comprehensive package from a single source. ATP has released 23 New Differentials covering 11.5 Million Vehicles and a new axle disconnect / actuator covering 1.8 Million Vehicles. ATP remanufactured front differentials offer the best alternative to bench rebuilding or buying a used differential unit. And with our no-core program, you save time and hassle by not needing to return the core. ATP Front Axle Disconnect Assemblies and Actuators are complete and ready to install to restore four-wheel drive operation. All units are designed to O.E. specifications in order to provide the same fit form and function as the original part. ATP Automotive is adding to its extensive line of cabin air filters with the addition of 53 new part numbers, totaling over 500 unique part numbers available. The new numbers will increase the industry leading program's coverage by 13 million vehicles. This line expansion adds both Premium as well as OE Replacement options for many foreign and domestic late model vehicles. ATP offers OE Replacement and Premium Filters, providing an upgrade opportunity for all applications. Premium Cabin Filters capture 98% of dirt particles, dust, mold spores and pollen entering the vehicle cabin, down to 3 microns. They work to eliminate odors with a highly porous coconut shell based carbon media. OE Replacement Cabin Air Filters capture 95% of dirt particles, dust, mold spores and pollen entering the vehicle cabin, down to 3 microns. The clean, chemical free material provides an entirely neutral filter. A new cabin air filter can improve airflow inside the vehicle, as over time the filters catch dirt, leaves and road grime that obstruct flow. ATP has further upgraded the Transmission Filter line with 35 new numbers covering 18 Million Vehicles. With 60+ years of experience in transmission service, providing OE filtration performance, innovative gasket technology and unmatched coverage, the ATP program is truly second to none. On this release we offer increased coverage on top Domestic, Import and European applications through 2016 model years, a unique solution for popular ZF 8-Speed transmissions, and coverage on new DCT (dual clutch transmission) applications. ATP Premium Transmission Filters are designed to capture internal transmission contaminants from standard to extreme operation and provide OE specified fluid flow, ensuring transmission longevity. Many filter kits include the exclusive 3rd Hand Pan Gasket which features guide holes that catch pan bolts, for fast and easy pan installation. The gasket material lays flat, requires no additional sealants and expands with the initial heat cycle to prevent leaks and retain bolt torque. 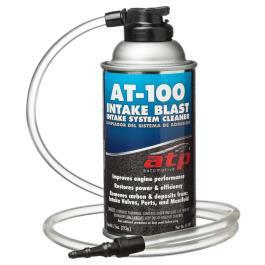 This month ATP has introduced a new product: AT-100 Intake Blast - Intake System Cleaner, a brand new addition to the ATP Premium Chemical program. AT-100 brings a unique solution to top end engine cleaning in a comprehensive kit, including everything you need to complete the service quickly, safely and efficiently. This highly effective product is perfect as a standalone service or add-on to any tune-up for the professional technician. The attractive packaging and ease of use also make the product appealing to DIY customers. Recommended on EFI traditional fuel injected engines, over 75,000 miles (repeat every 25,000 miles) due to carbon build up over time. Critical for GDI gasoline direct injected engines every 15,000 miles as fuel does not flow through or clean the intake plenum, ports or valves. ATP Automotive is pleased to announce 30 new numbers to the Transmission Electronics category, including 17 solenoids, 8 sensors and 5 wiring harnesses. These new numbers add coverage for high VIO applications, covering a total of 48 million vehicles. Included are parts for popular domestic applications, as well as highly expanded import coverage. The category expansion further improves ATP's market leading program with over 300 part numbers. We are pleased to announce the relaunch of the ATP Chemical Program. The program now follows our new branding, with clear and easy to read packaging and contemporary graphics that reflect the quality and effectiveness of the products. All ATP chemicals are manufactured to the strictest standards in TS16949 accredited plants and are proudly made in the USA. ATP Automotive is expanding the Flex Plate Product Line with 7 OE Replacement numbers for late model GM, Ford and Chrysler car and truck applications. The new numbers increase the industry leading program's coverage by 4.8 million vehicles. In addition to the line expansion, ATP is introducing a new line of 10 Heavy Duty Flex Plates for the customer that demands the best in durability and corrosion resistance. These new flex plates offer coverage for key performance, high output, off-road and commercial applications. ATP Automotive is a one-stop source for automatic transmission flex plates. ATP flex plates features high grade stamped steel base plates, hardened ring gears and are manufactured with an automated welding process ensuring exceptional durability. Each base plate is machined and trued for zero runout and every unit is precision balanced to factory specs. The newly introduced ATP Heavy Duty Flex Plates offer key improvements for the most demanding applications. These premium Flex Plates feature double-welded base plates and a durable zinc coating for corrosion resistance.